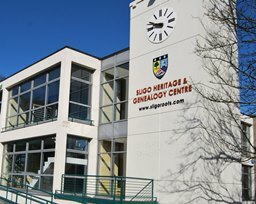 The County Sligo Heritage and Genealogy Centre has produced a new film depicting the history of passenger travel and emigration from the port of Sligo. The video presents Sligo's importance as a point of departure for thousands of men, women and children from the west of Ireland prior to and following the Famine years. Prior to 1855, most of the emigrants took their passage direct from Sligo to North America, typically to New York; Boston; Quebec; and Saint John, New Brunswick. In the latter half of the 19th century, the majority of emigrants took coastal steamers to Glasgow or Liverpool and crossed the Atlantic from those ports in large purpose built ships. Personal visitors to the Centre in Sligo's Temple Street (neighbours are the Hawks Well Theatre and Failte Ireland) can view the 15-minute video on request.